The first thing people look at when they see you is the face. Consequently, to make a good impression, your skin and skin texture has to be the best it can be. Therefore, your skin has to be free of blemishes, look smooth, and healthy. And described below are the things you can do to make that happen. First of all, eating healthy foods, along with your diet, is essential to keep your skin looking healthy. Ultimately, that means eating foods low in bad fats and carbohydrates. And, instead, eating foods rich in antioxidants. For instance, foods like salmon, sweet potatoes, beans, dark green vegetables such as broccoli, walnuts, almonds, other nuts, blueberries, and purple or red grapes are all rich in antioxidants. As a result, these foods help protect your skin. In fact, foods rich in omega-3 fatty acids are essential for you to have good skin. And these are found in walnuts and fish. Also, omega-3 fatty acids have anti-inflammatory properties that helps your skin. In addition, studies show that complex carbohydrates, such as whole grains, as well as healthy proteins also protect against skin breakouts. Furthermore, eat foods rich in vitamins C, E, and selenium. In fact, these foods help protect your skin from signs of ageing, discoloration, wrinkles and damage from the sun. Finally, eat plenty of lean proteins and don’t forget the fruits. Next, reduce sugar consumption. In fact, excess blood sugar results in the formation of harmful molecules called advanced glycation end products, which weakens the skin’s elastin and collagen. Also, because dehydrating caffeine causes your skin to dry out, cut back on your coffee consumption. And, don’t forget the caffeinated tea. In addition, alcohol, being a diuretic, causes the body to lose water. 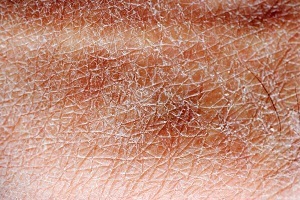 Consequently, your skin becomes drier and your blood vessels dilate. Regrettably, drinking alcohol over long periods of time permanently damages your blood vessels. Consequently, your skin turns and stays red. Strangely enough, red wine can trigger flare ups of rosacea. On the other hand, green tea helps your skin texture. In fact, green tea is known for its strong anti-oxidants. Also green tea helps your skin get hydrated and restores your skin. Finally, green tea also provides you with some caffeine. By interrupting the way collagen gets broken down, vitamin A prevents sun damage to the skin. Both the epidermis and the dermis need vitamin A. Because it is an antioxidant, vitamin A helps reduce the effects of sunburn. Finally, your skin may feel dry and itchy, if you don’t get enough vitamin A.
Vitamins and minerals improve the texture and smoothness of your skin. In fact, the skin’s epidermis contains vitamin C. And, to a lesser extent, the skin’s dermis also contains vitamin C. Above all, vitamin C is a powerful antioxidant to repair skin and prevent damage. Furthermore, vitamin C reduces scar tissues, age spots, and skin pigmentation. Regrettably, the skin’s ability to repair itself suffers with low levels of vitamin C or zinc. On the other hand, eating fruits like bananas, strawberries that contain large amounts of vitamins C, D or E, replenishes vitamin levels. Regrettably, the skin’s vitamin C decreases because of dry skin and/or ageing skin. Ultimately, vitamin C deficiency shows up as uneven skin texture. Also, sunlight and pollutants strip away vitamin C from the skin, especially in the epidermis. Therefore, taking vitamin C orally is important in replenish the skin’s vitamin C. However, you can also use creams and moisturizers with vitamin C to replenish the skin’s vitamin C.
Most of all, vitamin C fights free radical damage from smoking, being in the sun and air pollution. Indeed, these latter things deplete the skin’s moisture, collagen and ascorbic acid. So, using vitamin C toners or creams help neutralize the skin. Finally, another way to fix uneven skin texture is to use freshly squeezed lemon juice as a bleaching agent. Indeed, just apply a thin layer of lemon juice on your skin. And wait for 10 minutes. Then, use warm water to wash your skin. Moreover, doing this two times a week, will get rid of skin discoloration or pigmentation. First of all, both vitamins E and C work together to strengthen cell walls. Next, vitamin E is not only an antioxidant it is also anti-inflammatory. Also, vitamin E helps absorb the energy from ultraviolet rays to lessen skin damage that leads to wrinkles, sagging and skin cancer. The epidermis has more zinc than the dermis. And, the role of zinc is to help your skin heal from injury. Also, it’s needed to keep skin walls stable as well as allow cells to divide and specialize. Finally, zinc helps protect the skin from the damage of ultraviolet rays, by acting as an antioxidant. The mineral, selenium, helps protect your skin from ultraviolet rays. Regrettably, insufficient selenium increases chances of getting skin cancer. Meanwhile, to help keep your skin hydrated, drink plenty of water. In fact, skin that is properly hydrated retains its pliability and is less likely to get chapped, scaly or flaky. Next, because exercise improves blood circulation, your skin gets nourished. In fact, increased circulation brings more oxygen and nutrients, which helps your skin produce collagen to fend off wrinkles. Also, exercises like running, jogging are best for blood circulation and also cleansing your body. Above all, exercising also helps you lose fat and weight. But, if you really don’t have time to spare for exercising, just take a brisk walk in the neighborhood. And don’t forget to sleep the recommended seven to eight hours every night. In fact, good sleep helps your body and skin. Also, it helps fend off dark circles under your eyes, pale skin, and puffy eyes. Also, remember the bags, under your eyes, become worse when sleeping on your stomach. As a consequence, sleep either on your sides or on your back. And if you do sleep on your side, it’s good to frequently alternate sleeping between the two sides. Because, just sleeping all night long on one side, may cause you to get wrinkles on the side where the face is constantly pressing against the pillow. Regrettably, the sun is responsible for 90 percent of your skin damage. Also, your risks of getting skin cancer increase as you spend more time in the sun. Above all, the sun’s ultraviolet A (UVA) radiation damages your skin by causing skin cancer, premature aging, wrinkles, skin discolorations, age spots, freckles, and benign growth. So protect your skin by wearing sunblock every day and reapply regularly if you are outdoors for a long time. And look for sunblock containing titanium dioxide, zinc oxide, or avobenzone. In addition, use sunblock having a SPF that is greater than thirty. Above all, sunblock prevents skin wrinkles. Also, sunblock helps keeps the skin supple. And, sunblock decreases the redness in the skin’s color. Next, sunblock reduces the unevenness in skin tone. Finally, sunblock helps reduce the appearance of veins on the face. And, while your skin gets vitamin D from the sun, the sun also harms it. So, wear a wide-brimmed hat if you have to go in the sun, along with long sleeved tops and pants or long skirts to protect more of your skin. Most of all, towards the end of spring, summer, and start of fall, avoid the sun between 10 AM to 2 PM, when the sun’s rays are the strongest. While, towards the end of fall, winter, and start of spring, avoid the sun between 10 AM to 4 PM. Most of all, oils from your skin are removed when you taking a hot shower, a long shower or both. So, care for your skin and take a warm shower instead. Also, take the shower quickly. Limit your showers or bath from five to ten minutes. Next, when sleeping, use a humidifier in the bedroom so that your skin retains moisture. Also, during the day, use a humidifier, wherever you spend most of your time, so that your skin continues to retain moisture. Similarly, strong soaps or cleansers strip oils from your skin. Therefore, use mild soap or cleansers. Before shaving, protect and lubricate you skin by applying a shaving cream, gel or lotion. And always use a sharp and clean razor. Finally, instead of shaving against the direction your hair is growing, shave in the direction your hair. Instead of rubbing the towel over your skin, pat your skin, with the towel, to dry it. As a result, your skin gets moisturized. Most of all wash your face. In fact, washing removes germs, oils, dirt, and dead cells from your skin. However, don’t scrub because that can cause irritation and lead to chapped skin. Accordingly, get your face washed, in the morning and at night, with warm water and a mild cleanser. Hence, with a circular motion, gently massage your face with your fingers. Next, thoroughly rinse your face to remove all soap and dirt. Then, pat to dry your skin. Finally, apply moisturizer. First of all, dehydration causes oxidative stress which results in free radicals. And, without moisture, your skin isn’t able to repair itself. Therefore, use moisturizers to moisturize your skin and protect it from free-radicals. Above all, moisturizers should contain hyaluronic acid, ceramides, or coconut oil. Finally, always apply on damp skin to keep the moisture in your skin. Ageing as well as dehydration results in uneven skin texture. As a result of ageing and dehydration, dead skin cells start to accumulate. And this accumulation of dead cells makes your skin rough and coarse. Exfoliation removes loose or dead skin cells above the epidermis. Also, it extracts dirt from pores, clears blackheads, and clogged pores. In addition, exfoliation promotes suppleness and a smooth texture while enhancing your skin’s collagen and natural oils. Most of all, exfoliate your face or whole body two or three times a week. However, so that your skin doesn’t get irritated, it’s important not to exfoliate too often. Most noteworthy, exfoliation improves blood circulation. ​Natural exfoliants include fibers of certain fruits, grains and vegetables. Next, mix natural ingredients like sea salt with fibers and polish over your skin for better texture. And remember not to scrub too hard - only light scrubbing for one or two minutes is sufficient. Incidentally, as you exfoliate your face, it’s important to stay away from your eyes and mouth. Essential oils are best for fighting buildup of dead skin cells and skin discoloration. Most of all, ginger oil penetrates deep inside the skin for toning and cleansing. As a result, it prevents and treats ache, wrinkles, fine lines, and pigmentation. The ethanol extract of licorice has moisturizing and cleansing benefits. In fact, it reduces toxic chemicals like mitochondrial anti-lipid peroxidation from skin layers, thereby improving cellular activity. Which in turn reduces skin discoloration and pigmentation caused by ageing. First and foremost, curcumin is one of the main compounds of turmeric with strong antioxidant with anti-inflammatory properties. Therefore, it helps the skin by reducing inflammation and detoxification, which in turn gives your skin a supple texture. And, the best way to use turmeric oil is by massaging five or six drops of turmeric oil, with a carrier oil like jojoba or coconut oil, on pigmented or discolored areas. Furthermore, turmeric oil also reduces inflammation caused by sun damage or ageing. Research shows that marula oil moisturizes and hydrates your skin. And it won’t clog the pores. And it contains antioxidants, vitamin C, vitamin E, and flavonoids. Finally, it is quickly absorbed by the skin without leaving you greasy. Because green tea oil contains large amounts of antioxidants, it is used for treatment of skin inflammation and sensitivity. In addition, green tea oil has a direct impact on fighting acne, ageing skin, and skin pigmentation. Because yogurt is a good source of lactic acid, spreading it on the skin reduces dullness and darkening of skin. Moreover, a study showed that regular exposure to yogurt improves uneven skin texture. Indeed, honey containing pollen is the easiest way to fix uneven skin texture. Because honey is good for locking in moisture and natural oils, applying honey to the face, improves skin dryness. Because coconut water contains cytokinins, with their powerful anti-aging properties, coconut oil has a direct effect on glowing skin. Also, coconut oil is good for healing acne scars, fine lines, and wrinkles. And, coconut oil reduces clogged pores while hydrating your skin. Because coconut water is a good facial cleanser for sensitive skin, add a few drops of coconut water on a cotton ball and gently scrub all over your face. Cannabidiol or CBD liquids, also known as CBD oils with their anti-inflammatory properties and their ability to reduce sebum production helps treat acne. Creams with retinol stimulates production of elastin, which makes youthful skin snap back when you press it. Also, retinol stimulates production of collagen along with cellular regeneration. If you have to treat your skin for two or more conditions, treat them separately. For example, if you going out in the sun, only apply sunblock and nothing else. And treat your wrinkles separately in the evening or night. Because the humidity inside airplanes is low, your skin dries out. Therefore, moisturize before, during, and after your flight. Also, avoid wearing makeup when traveling on airplanes. Next, winters cause your skin to get dry and flaky. As a result, your eczema and rosacea get worse. Moreover, the dry heat in the house makes it worse. So, consider adding a humidifier in the home. In addition, drink water often and apply skin moisturizer throughout the day..
Regrettably, as you get older, your skin changes and your skin’s production of collagen decreases. Also, the skin’s elastin becomes weaker. Therefore, your skin doesn’t spring back as quickly as it used to. Furthermore, neither do you lose nor create skin cells as quickly as you used to. So to help your ageing skin, use a nondrying soap to moisturize your skin and also remove dead skin. Finally, use retinol creams to reduce fine wrinkles. Stress makes your skin sensitive and causes your body to produce cortisol along with other hormones. As a result, oil production increases, making your skin oily. Because stress triggers breakouts of acne and other skin problems, take steps to reduce your stress. Above all, smoking results in your skin looking older. It also makes your skin susceptible to wrinkles. In addition, tiny blood vessels in your outermost skin layers get narrow, which reduces blood flow and makes skin look pale. In addition, reduced flow of blood means your skin doesn’t get enough oxygen and nutrients needed to keep you skin looking healthy. Moreover, smoking destroys elastin and collagen while decreasing levels of estrogen needed to keep your skin firm. Also the facial expressions you make when smoking, such as squinting your eyes to keep the smoke out and pursing your lips in inhale, causes wrinkles to appear on your face. Lastly, smoking increases your risk of squamous cell skin cancer.